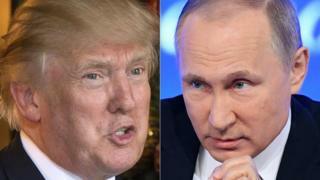 US President Donald Trump and his Russian counterpart Vladimir Putin will hold a summit in the Finnish capital, Helsinki, next month. They will meet on 16 July and discuss relations between the two countries and a "range of national security issues", the Kremlin and White House said. The face-to-face meeting comes at a time of poor relations between Russia and Western nations. Nato's chief welcomed the talks, saying "dialogue is a sign of strength". "We don't want a new Cold War, we don't want to isolate Russia, we want to strive for a better relationship with Russia," Jens Stoltenberg said. Mr Trump's visit to Helsinki will follow a Nato summit in Belgium and a stop in Britain for talks with Prime Minister Theresa May. While the White House and Kremlin statements were both short on detail, Mr Trump earlier said he would discuss the war in Syria and the situation in Ukraine. He went on to say: "I think we'll be talking about many other subjects. And we'll see what happens... I think a lot of good things can come with meetings with people." Since becoming president in January 2017, Mr Trump has sought to improve relations with Russia. Earlier this month, he alarmed allies by saying Russia should be readmitted to the G7 group of industrialised nations. Russia was suspended from what was then the G8 after it annexed Crimea from Ukraine in 2014. Moscow has also been accused of meddling in the elections of a number of Western countries - mostly notably the 2016 US election won by Mr Trump. US National Security Adviser John Bolton, who helped set up the summit, said the lifting of US sanctions imposed after the annexation of Crimea was not on the table for discussion. Mr Trump and Mr Putin have met twice before on the sidelines of summits. Their last meeting was in November at an Asia-Pacific meeting. Mr Bolton, who is known for taking a tough stance on Moscow, met President Putin on Tuesday in Moscow to set up the summit. He said both leaders wanted to use the summit to improve relations between their countries. "Both President Trump and President Putin feel that it's important for these two leaders of these two critically important countries to get together and discuss their mutual problems and areas of co-operation," he told reporters. "It's something that I think both feel will contribute to improvements in the US-Russia bilateral relationship and in stability around the world." President Putin meanwhile said his meeting with Mr Bolton had raised hopes for a full restoration of relations, which he admitted were not in the best of shape. Mr Putin insisted Moscow had never sought confrontation and that, in his view, the poor state of relations was a result of fierce political confrontation inside the US itself.